This wizard help you export resources from the Workbench. 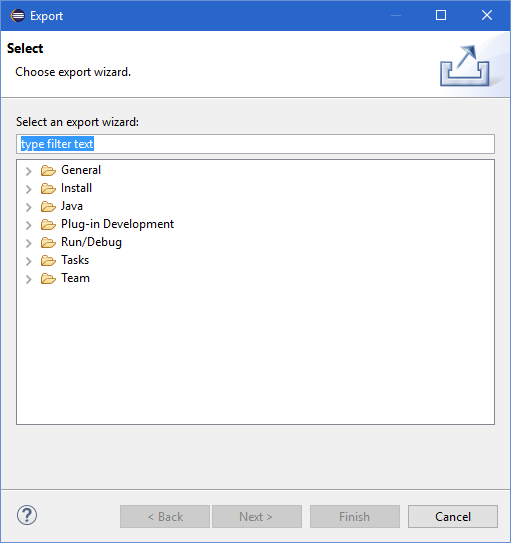 When the Export wizard first comes up, you must choose what type of export to do. To assist in locating a particular wizard, the text field can be used to show only the wizards that match the entered text. Generates Ant buildfiles based on the configuration of the Java projects. The project (and resources within that project) to use to generate the buildfiles. Check all resources for export. Check if the source directories of the projects have cycles or if there are dependencies between them that do not conform with the classpath order and therefore functional Ant buildfiles cannot be created. 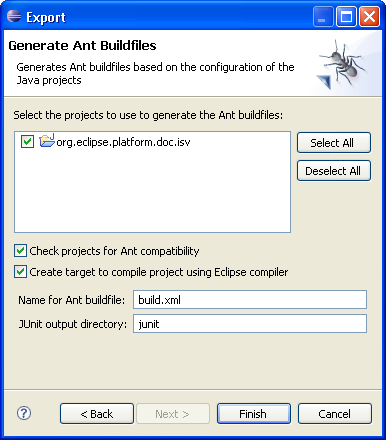 Add an Ant target to the buildfile that will compile the project using the Eclipse compiler. The name to use for the generated Ant buildfile. The name of the directory where the generated JUnit reports are placed after the build. Choose this option to export files to an archive file. The project (and resources within that project) to export to an archive. Dialog to select which file types to export. Use this to restrict the export to only certain file types. Check off all resources for export. 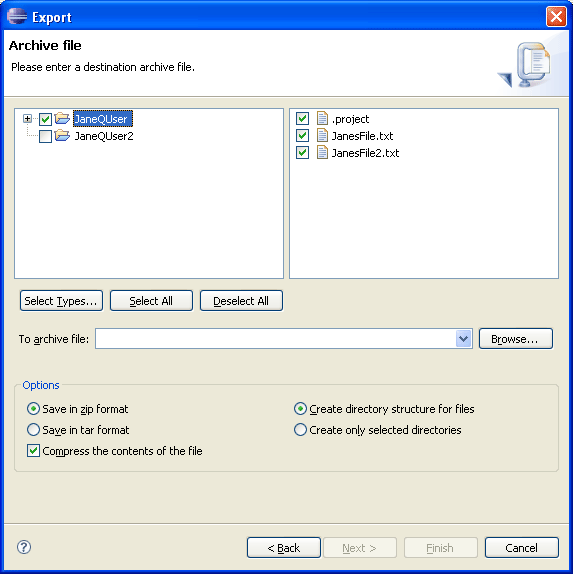 Archive File The path and name of an archive file into which the resources will be exported. Type the path, select a previous path from the drop down list, or Browse to select a path and file name on the file system. The archive file of the previous export, or <blank>. 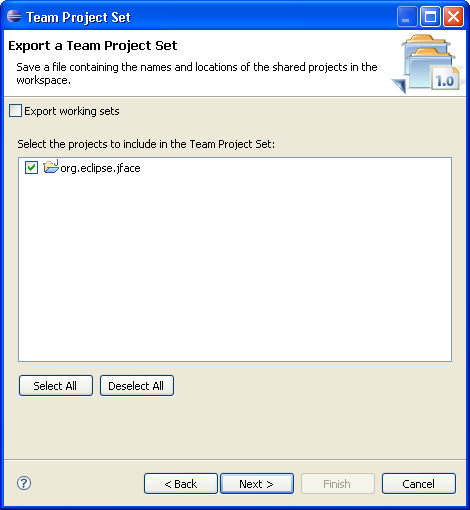 Create hierarchy (folder) structure in the file system as it exists in the Workbench. 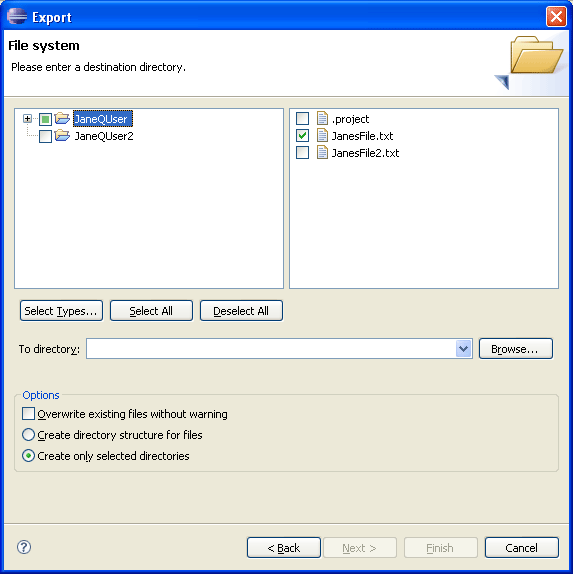 Create hierarchy (folder) structure in the file system only for selected folders. If you choose this option, you will export files to the file system. The project (and resources within that project) to export to the file system. Checks off all resources for export. 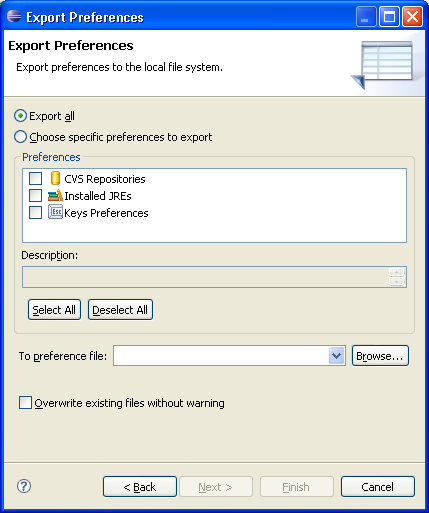 Export preferences to the local file system. Export all of the preferences in this session. Select preferences from this session to export, like CVS repository preferences. Select all of the available preferences. Clear all of the available preferences. A file on the file system to store the preferences. Type the file, select a previous export file from the drop down list, or Browse to select a file. Exports a description of the repository and version control information for a set of projects. This allows you to synchronize those projects correctly in a different workspace. The project(s) to export to the team project set file. The path and name of the file to export to.